Iran said Thursday that Israel's atomic arsenal is the biggest danger to world peace, a day after US President Donald Trump vowed to prevent Iran developing a nuclear weapon. Israel is the “biggest threat to the peace and security in the region and the world,” Foreign Ministry spokesman Bahram Ghasemi said, quoted by state news agency IRNA. 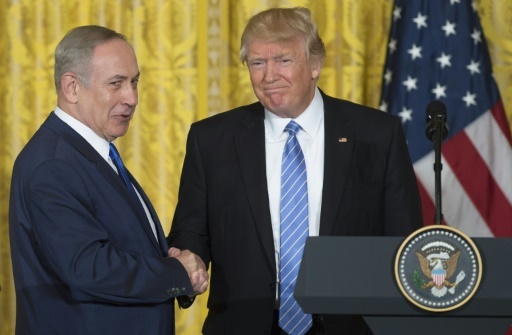 Trump had warned Wednesday after meeting Prime Minister Benjamin Netanyahu in Washington that the “threat of Iran’s nuclear ambitions” was one of the major security challenges facing Israel. The US president told reporters that he would do “more to prevent Iran from ever developing — I mean ever — a nuclear weapon”. But Ghasemi dismissed the comments by Trump and Netanyahu comments as “nonsense”. “The bitter truth is that these unjust claims are being repeated by the Zionist regime that doesn’t abide by any international laws and has hundreds of warheads in its atomic arsenal,” Ghasemi said, referring to Israel. Ghasemi said the United Nations’ atomic watchdog had repeatedly confirmed the peaceful nature of Iran’s nuclear programme. Israel is believed to be the Middle East’s sole nuclear power but it has long refused to confirm or deny that it has such weapons. A war of words has been escalating between Tehran and Washington since even before Trump took office in January. Under Trump’s predecessor Barack Obama, the US and five other world powers reached a 2015 deal with Iran to lift sanctions in return for curbs on its nuclear programme. Trump himself has repeatedly denounced the historic accord as “one of the worst deals I’ve ever seen”. The Islamic republic’s archfoe Netanyahu has warned that the deal will expire too soon to permanently remove the threat. Iran has consistently denied seeking nuclear weapons, saying its activities are exclusively for peaceful purposes such as power generation.